The Laundry Soda that you know and love! Nellie's Laundry Soda is perfect for every household. Its highly concentrated formula dissolves quickly in cold or hot water, rinses thoroughly and leaves no residue that makes fabrics stiff and irritating. FREE FROM: SLS, SLES, gluten, phosphates, fragrance and chlorine. 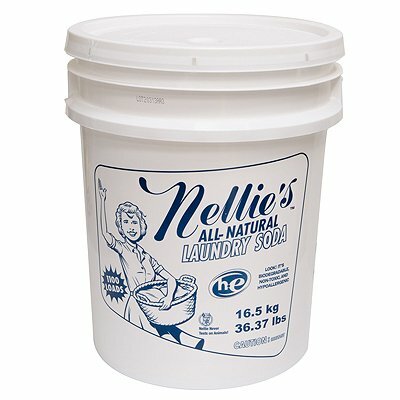 HOW TO USE: Use one tablespoon of Nellie's Laundry Soda for each regular sized load. Wash according to instructions on garments. Always test on garments that may bleed or fade. Nellie's Laundry Soda is safe for front loading HE and standard washing machines. INGREDIENTS: Sodium Carbonate, Linear Alcohol Ethoxylate, Sodium Chloride, Sodium Metasilicate. WHY POWDER? Liquid detergents are made up from at least 50% water. At Nellie's we don't think selling you water and moving water around the planet is a very good idea. The fact is, more cleaning power can be packed into a smaller space using powder. Free Shipping in Contiguous 48 States. Great Value-1100 Loads.